The Rockwood City Animal Shelter director resigned with no notice, leaving the shelter with no operating staff. The city ordered the shelter shut down and all animals euthanized if not out within hours. 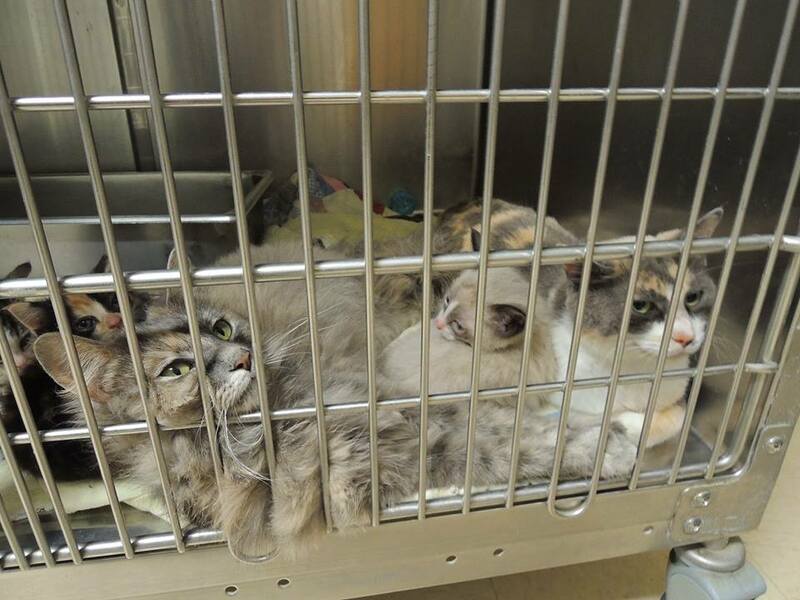 The Loudon County Friends of Animals (LCFOA) rallied troops and stepped in to pull nine cats. All the cats were taken straight to the vet for exams, diagnostic testing, and rabies vaccines. LCFOA treated them for fleas, ear mites, worms, and administered other vaccines. Only one cat, Miss Priss, was too sick to make it. 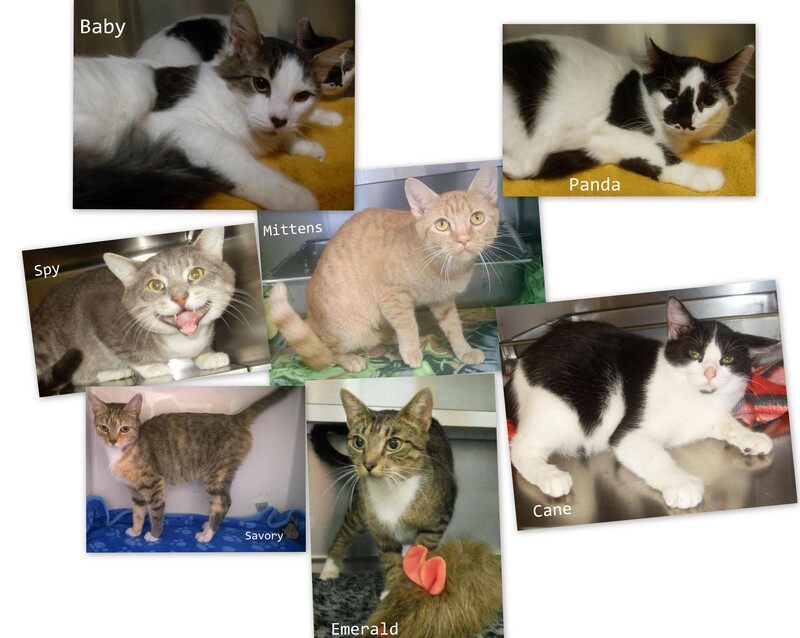 All others are in foster care and will be adoptable as soon as they’ve all been spayed/neutered. We helped LCFOA with the needed costs for the initial services, and Greyson, Grizzly, Harry, Olga, Oreo, Raven, Thumbalina, and Twinkle will go on to live wonderful lives thanks to this great rescue. 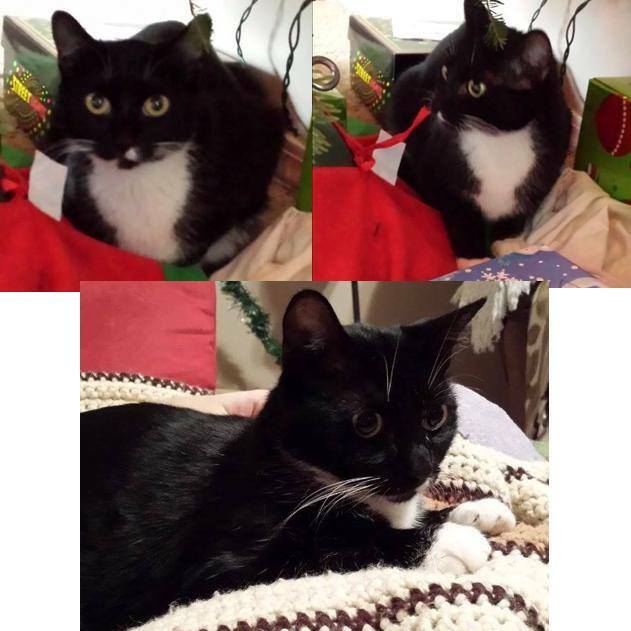 The Loudon County Friends of Animals (LCFOA) is doing miraculous work for needy cats. They asked us for $200 to be used for 10 tubes of Terramycin and $50 for antibiotics for Roane and Rockwood Shelters. The shelters have a lot of sick kittens with upper respiratory infections. LCFOA has pulled kittens, pregnant momma cats, momma cats with kittens and adults from four shelters (Loudon, Roane, Rockwood, and Blount) and taken from the community. 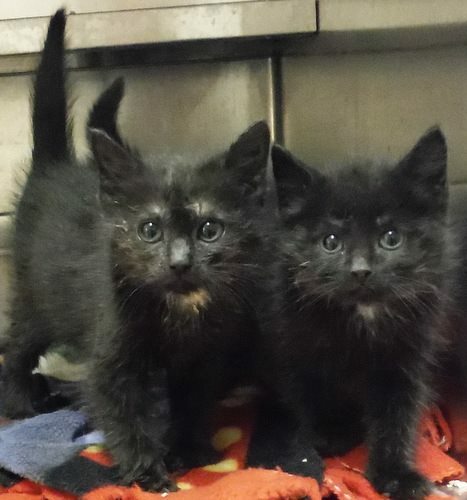 They have taken more into foster care than any other year and have 97 currently. 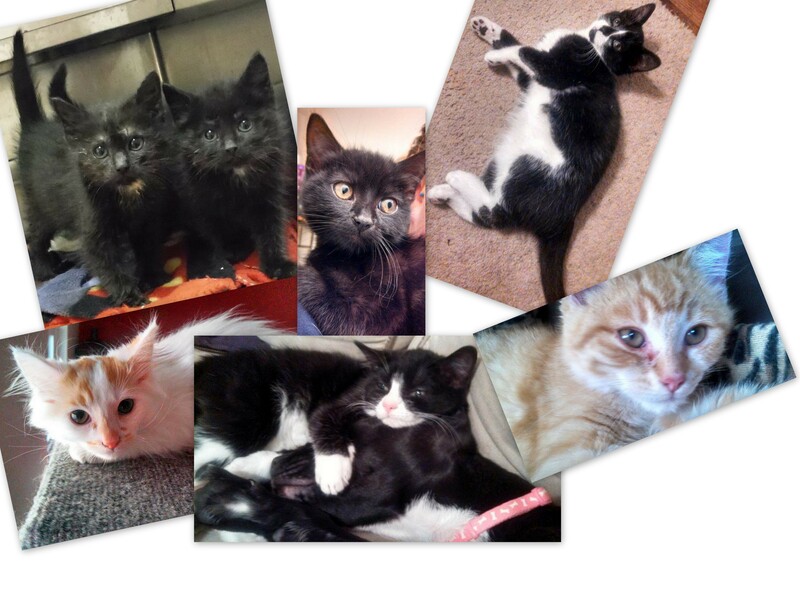 Only 27 have been spayed/neutered and are ready for adoption. They asked us for $1,250 to vet some of the remaining cats. Hopefully, adoption fees will fill the remainder of the funds needed. Pictured are some of the babies that are now old enough for surgeries. The Loudon County Animal Shelter was overflowing with cats and kittens. The Loudon County Friends of Animals (LCFOA) had a goal of saving enough cats and their kittens to avoid the need for euthanasia. Our $1,500 donation (~$53.57 per cat) was needed to ensure proper vetting of each cat, and then they can be adopted from LCFOA’s no-kill facility. The Loudon County Friends of Animals (LCFOA) organization is doing tremendous work caring for sick and injured cats and saving shelter cats, not to mention the active trap/neuter/release (TNR) program in Loudon County. LCFOA is currently working on five feral colonies and performing TNR on roughly 40 cats per month. When asked if we could help them with a $750 donation on achieving their mission, we were glad to do it. It would take many rescue efforts to save all the unwanted cats and kittens in the spring and early summer. Shelters are overloaded with them this time of year. The Loudon County shelter is no exception. 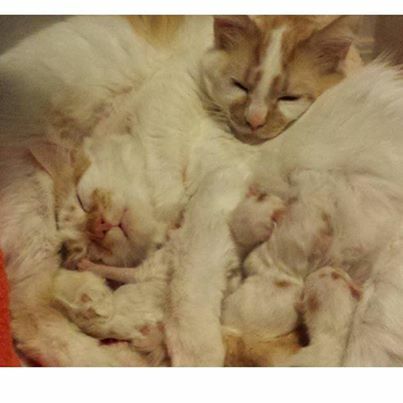 Thankfully, they are able to save some due to the efforts of the Loudon County Friends of Animals (LCFOA) who pulled 20 kittens and momma cats in one week-and that’s only roughly 5 litters! LCFOA doesn’t ask for help often, but this time they could use a hand, so we sent them $500 to offer some support. 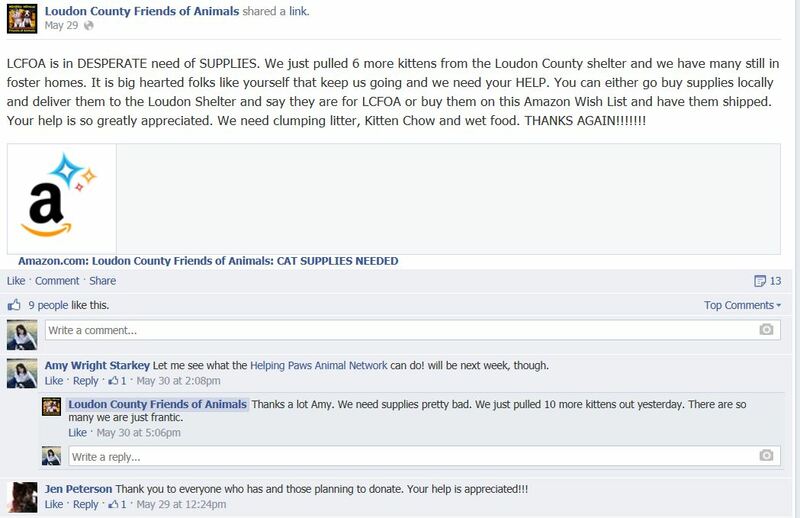 The Loudon County Friends of Animals, a non-profit rescue, saves many cats from the Loudon County Shelter. Unfortunately, with springtime comes an explosion in the cat population. 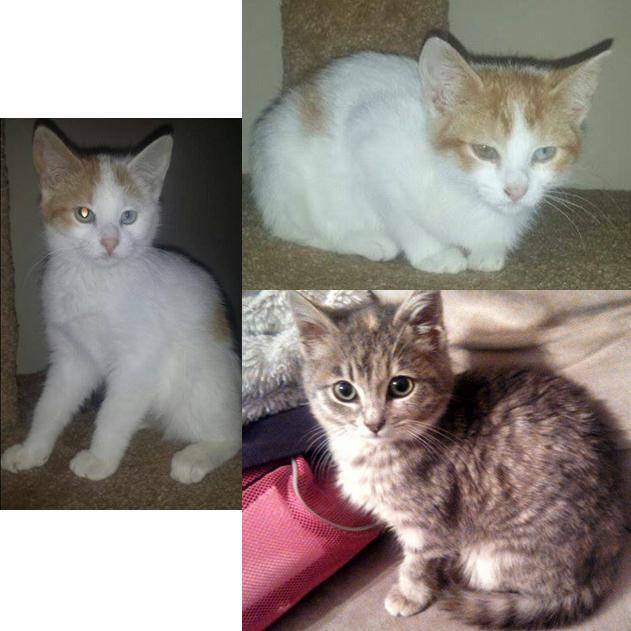 LCFOA can’t save them all, but they do the best they can, pulling many of the cats and kittens and placing them in foster care. We recently had the opportunity to send them a $200 donation when we saw their plea for help with the purchase of much-needed supplies for their foster babies. 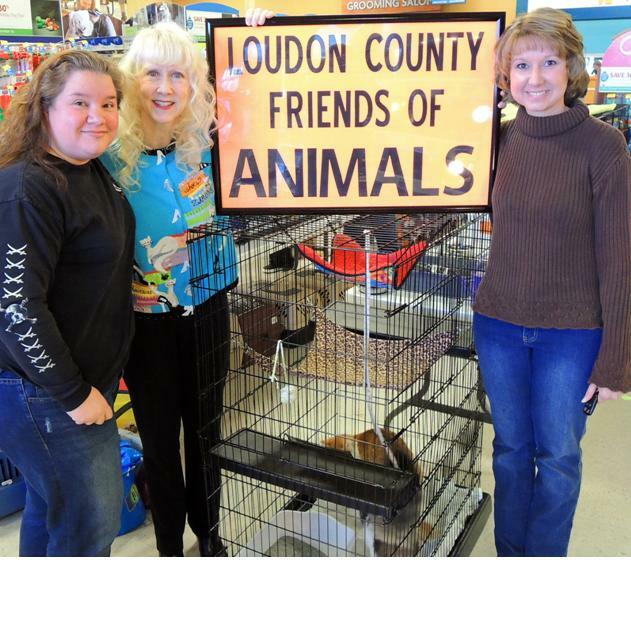 The Loudon County Friends of Animals (LCFOA) does a tremendous job saving animals from the Loudon County Shelter, and they have two wonderful volunteers who have decided to start their own rescue under the umbrella of LCFOA for now. Starting a new rescue is no easy feat! There are many items needed. LCFOA called on us to help with some of the start-up costs needed for cages used to transport the animals, vet services, flea treatment, etc. 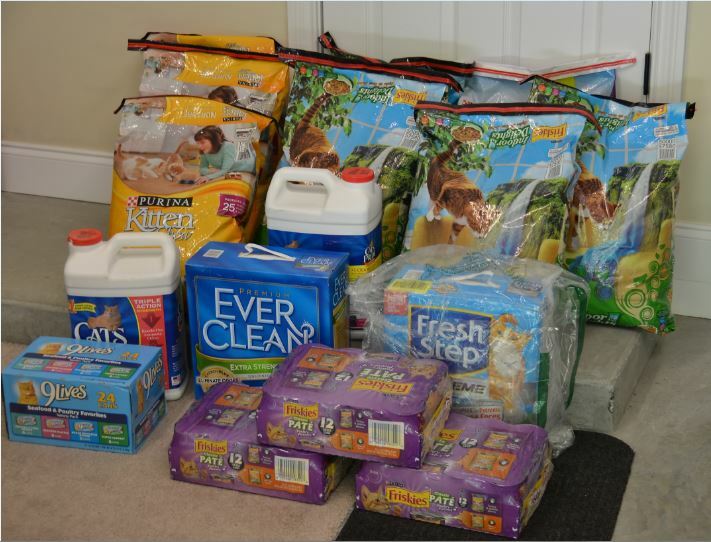 We were absolutely thrilled to have the means to send them $500 for these needed items. Pictured are these wonderful rescuers working their magic at the Turkey Creek PetSmart, where they are allowed to show their animals every weekend in hopes of finding them forever homes. Also, pictured below are the first two animals pulled from the shelter and saved under the new rescue.